Order the Shyam Lila CD on Mantralogy Records here! 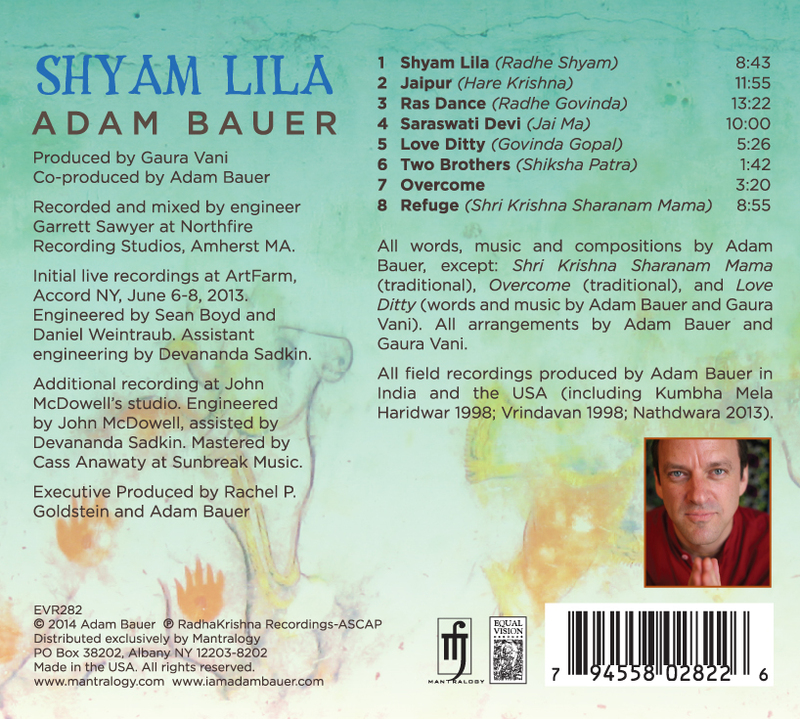 Shyam Lila is Adam Bauer’s first solo kirtan album, a personal tribute to renowned singer and Bhakti Yoga teacher Shyamdas featuring contributions from many of Shyamdas’s friends and collaborators, including Gaura Vani, John McDowell, Steve Gorn and many others. A deeply intimate expression of devotion, the album showcases Bauer’s vocals, harmonium and signature electric bass, augmented by a lush tapestry of additional vocalists and instruments including tabla, organ, sitar, guitar, piano and bansuri flute. Most of the eight songs on Shyam Lila arose in India during the weeks following Shyamdas’s unexpected death in 2013, as Bauer reflected on the sacred teachings and life of his kirtan brother, Bhakti Yoga mentor and friend. According to Grammy-nominated singer Jai Uttal, Adam’s kirtan is “So full of heart, so full of emotional honesty and beautiful musicianship, and just great, great, great!” Produced by Gaura Vani, the overall sound of the album captures the natural, heartfelt and spontaneous synergy of devotional music and chanting shared among friends and devotees. Shyam Lila is available for purchase here and on iTunes and Amazon. Please direct all interview and booking requests to adam@iamadambauer.com. We want everyone to enjoy this sacred chanting medicine, so on this page only, we’ll be offering an honor system of download payment: Pay what you can. If you can pay any amount for the music, that’s fantastic, because man, recording and touring is expensive! The more music lovers contribute, the more musicians can keep making good music down the road. And if you need the musical medicine but cash is too tight, then please, enter $0 in the box below and enjoy, with Adam’s blessings. And let’s all keep paying it forward as best we can, yeah? Help us out! It really helps musicians like Adam when folks help spread the word: so if you enjoy Shyam Lila or Adam’s live chanting, please hit the social media airwaves and tell your friends. Your support is so appreciated—thank you! 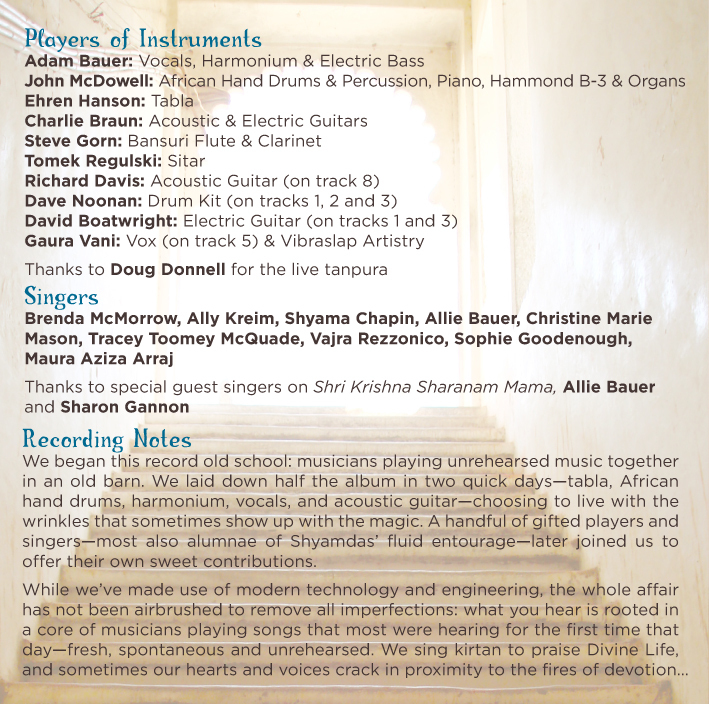 Info on the musicians on Shyam Lila, track list, and more are below.